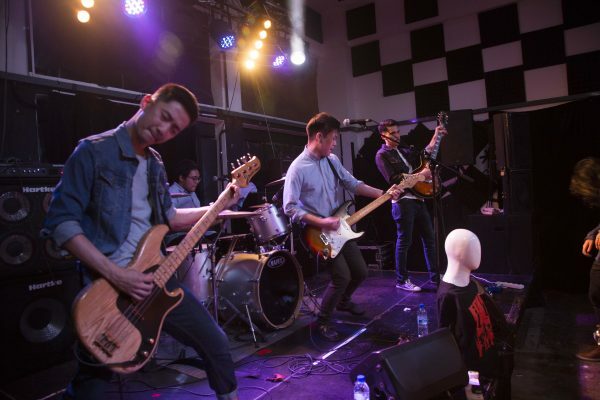 SINGAPORE ROCKS | POWER POP ROCK N ROLL : S-ROCK FIGHTS BACK AT THE MANNEQUINS FOUR EP LAUNCH!!! It does not matter how many social media ‘likes’ Singapore rock bands are able to muster. It does not matter how many Spotify playlists Singapore rock bands are excluded from. It does not matter if Singapore rock bands are not considered hip and cool amongst the local scenesters and hipsters. All that matters is a love and passion for rock ‘n’ roll! And in that respect, the recent Mannequins Four EP Launch had that in spades – many not in quantity but definitely demonstrated with intensity! Author Kevin MathewsPosted on June 26, 2018 Categories MUSICTags Alt-rock, Bouncy Castles, Causeway Youth, Flase Plaintiff, Knightingale, Live Review, Mannequins, Melodic Rock, Pop-rock, Power Pop Rock N Roll, Reviews, S-ROCK, SGINDIE, Singapore Rocks!! !, Suneater, The Groove GurusLeave a comment on SINGAPORE ROCKS | POWER POP ROCK N ROLL : S-ROCK FIGHTS BACK AT THE MANNEQUINS FOUR EP LAUNCH!! !